This event was located in central Florida parks and wetlands approximately 1 hour NE of Tampa, Florida. Pre-race conditions were dry and cold with a temperature range of 26 – 60 degrees Fahrenheit through the day. No precipitation was forecast. Our trip to the event turned out to be quite a challenge. Three of our four team-members were scheduled to fly from Boston on Thursday afternoon to arrive in Tampa a day prior to the event, but this was not in the cards. The previous days' snowstorm, troubles with Jet Blue and a certain NASCAR event in Florida reduced airline capacity and increased demand. A rented van took the place of the friendly skies and a 21-hour drive lay before them. For my part, transportation went smooth until I arrived in Orlando without a car reservation. The Daytona 500 fans rented everything with four wheels and left me to wait for Jim Holden who kindly left the event registration to retrieve me. I arrived at the pre-race meeting site seven hours after landing – depending on my team-mates to assemble my bike and take notes at the meeting. What a slacker! Nothing unexpected with the sleeping arrangements: four of us in a small hotel room with every square foot of floor-space covered with bikes, clothing and equipment of every description. Reviewing routes and gear, packing and re-packing lasted until nearly 2AM with the alarm set at 6AM. 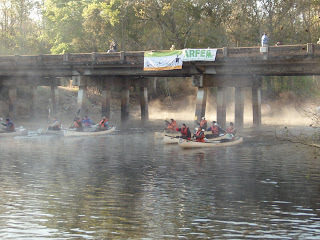 The race started with a paddling leg at about 8AM with temperatures a few degrees below freezing. We were wearing our rain suits to retain heat and stay dry. The river was flat, slow and wound casually through the cypress swamps. These were perfect conditions to look for alligators, snakes and turtles but the cold temperatures kept them out of view. The area was a bird watchers paradise, though. There were great blue herons and other wading birds, hawks, ospreys, kingfishers and ducks. We performed quite well during the paddling and associated navigation. We gathered every checkpoint and bonus checkpoint along the way and spent a great deal of time in the first and second position for this category. We finished the paddle with a long portage almost exactly ten hours after we began. Our transition from boats to bikes went smooth and fast. We were soon on our way to the climbing section. After a few minutes we arrived at our objective – a wooden tower apparently designed for training of this type. Each team-member climbed one side on belay and rappelled down another side with hints used to find the next checkpoint. Darkness fell as we located this checkpoint and continued the event on our bikes with lights ablaze. What started as a fast-paced bike orienteering leg soon ground to a halt when we found ourselves completely unable to locate the “geocaching” checkpoint. Two hours of searching and two days of sleep deprivation were taking its toll on our accomplished, competitive orienteer. My trusty stash of Vivarin was inadvertently discarded with some trash and we found ourselves in a hopeless competitive position. It’s unusual for these team-members and hard to explain in retrospect, but we found our position unacceptable and we decided to withdraw and compete another day.